Ratchet straps are a simple yet extremely useful tool for camping. I use them to strap my equipment to the car and transport it safely. They have proven to be a lot better and more reliable solution than any alternative I used so far. I’ve tried a lot of strings and ropes, and almost every time some piece of the equipment would end up on the road broken. From that point on, I tried some of the straps, and I will mention a few who are some of the best ratchet straps you can find today. How Much Weight Can a Ratchet Strap Hold? How to Use a Ratchet Strap? Ratchet straps are fasteners engineered to hold the equipment securely during transport. They are called “ratchet straps” due to their mechanism (ratchet) which is used to tighten the straps and hold the equipment more securely. They go over and under the equipment and they are fastened to a part of the vehicle, holding the equipment in place. Why would you use a ratchet strap instead of some piece of rope or anything else close to your hand? Well, that’s what I was saying until I started losing the equipment all over the road. With ratchet straps, you can be sure that your equipment will stay in place intact until you reach your destination. They are specifically designed for the purpose of transporting the equipment securely, which gives them an engineering advantage compared to any other alternative solution. Ratchet straps are the most reliable solution for equipment transport. They are made of strong and durable materials, which are water and dust proof, and they don’t stretch. The build quality of ratchet straps ensures you that your equipment will remain safe and secure no matter the weather conditions. You can drive in the rain, and your equipment won’t move, you can drive in open sun, and they won’t stretch and loosen up, and any dust that wind may blow onto the ratchet, won’t impact their performance or damage the mechanism. They are compatible with various types of equipment, and you can find the compatible versions based on the weight of your cargo. In most cases, straps with 1.5 tons of rating will be enough to strap your equipment to the top of your car. But, if you travel heavy, you can find the ones that have 10 tons of rating and much longer straps. There are also a lot of different lengths of straps to choose from if your equipment is not heavy, but bulky. The compatibility is brought to the max; you just need to figure out the length of the straps you need, since I doubt you will need the ones for heavy cargo when you’re going camping. Ratchet straps are extremely versatile, based on your needs and the types of cargo you have. That’s why I was able to easily find the ones suitable for camping. 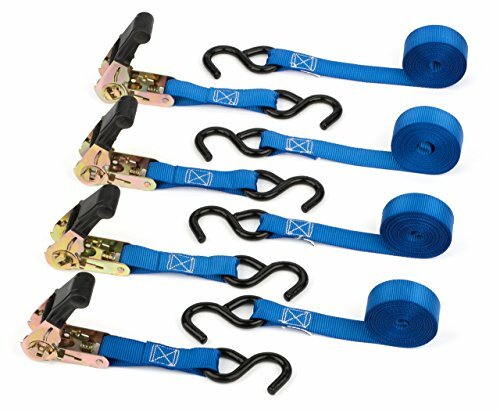 Depending on how you want to fasten the equipment to your car or pickup truck, you can choose the way the straps are locked and connected. You can choose from d-rings, flat hooks, flat snap hooks and a lot more. This kind of versatility enables the transport of the equipment no matter how big and bulky it is and no matter what type of vehicle its transported on. They are easy to use and set up, which makes the packing a lot faster, compared to the time I used the rope to fasten everything. I don’t have to spend the time to figure out how to tie everything together in order not lose anything on the side of the road. And even after I spend a lot of time fastening everything it still doesn’t stay in a place like I would want it to be. With ratchet straps, I’m done in minutes, and I’m sure that everything will stay in place. 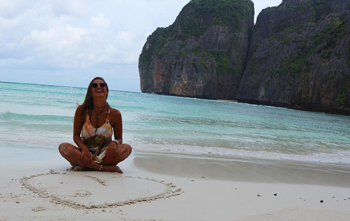 Before I was getting pretty frustrated, packing is always the worst part, and not being able to be done with it fast was a big problem for me. And they are the best way to secure the equipment and hold everything in place because I can tighten everything to the roof of my car so it can’t move an inch, no matter the terrain I drive on. I’ve tried a lot of techniques using ropes and cables, and the equipment never stood in its place during transport. And I was lucky enough that I ended up with broken equipment only once, which led me to find the better solution, so I thought of big trucks and the straps they use. I didn’t know that I would find a smaller version of ratchet straps that would fit my car and the equipment. There are two basic types of ratchet straps: two-piece straps and the loops. You should know the difference between these two types to be able to pick one for your needs. The two-piece strap is exactly what the name suggests. The two pieces are fastened to each end of the cargo and then connected together. Once they are connected, you can proceed to tighten the bond. These are most commonly used to keep the cargo pressed down on the surface, but they can also be used in a similar way like the loop straps, they are the most versatile option. The loop straps is a one-piece strap that is looped around the equipment and fastened to the floor. They have fasteners on each end that are used to manipulate the tension. The loops are much longer than the two-piece strap, and they are not that easy to use in comparison, but still very reliable and a good way to secure your equipment. So, we’ve come to the conclusion that ratchet straps are a much better option than any improvisation or an alternative, but how does one choose the best ratchet straps from a bunch? Working load limit rating. It would be the best that you measure the total weight of your equipment, and choose the straps that are in that range of working load limit. It would be ideal to get the straps that can handle a bit more weight than your equipment. This way you can be sure that they can withstand and hold everything in place. Narrow down the choice by the type of the ratchet strap. Based on how you pack your equipment and how can you strap it on your vehicle, choose the right type of ratchet strap that is the best to fasten everything tightly. Pay attention to the material type and quality. Most of the straps are made of very durable and quality materials, but not all manufacturers use the same materials to produce them. The material quality and types can vary, and the mass-produced consumer-grade materials might not do the trick for camping equipment. These are the basic and the most important factors you should pay attention to. Now you can filter your choice further to your personal preferences. If you don’t like the color, then, by all means, get the one that you like the most, but that should be the last thing you should worry about. 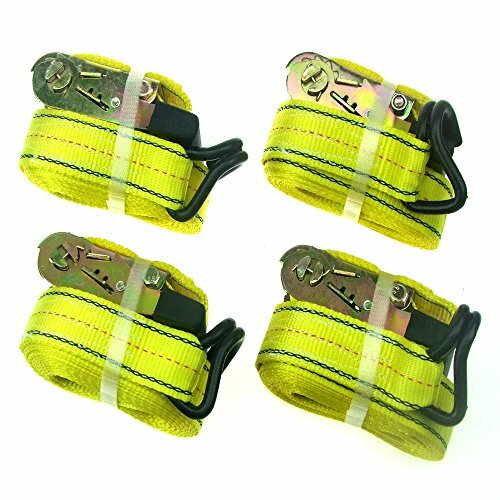 I selected a few ratchet straps that could be a good choice, based on my experience in camping, so take a look, and maybe I will manage to help you with your search. These ratchets are one of the most popular ones, and the first ones I came across. They come in a package of four straps, with each 15 feet long. Their workload limit is 500lbs, and their break strength is 1500lbs. These are not the biggest numbers out there, but they are good enough for camping equipment. The straps are 1 inch wide, and they have rubber coated S-hooks. 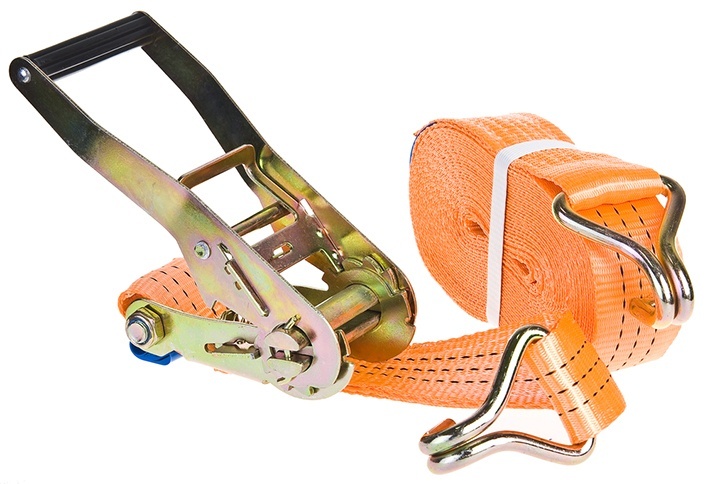 These straps are meant to be used in a variety of situations, which means they are suitable for a lot of applications, but they don’t stand out in any specific. They are very affordable, which can be a great deal for some, especially if your equipment is not that heavy. 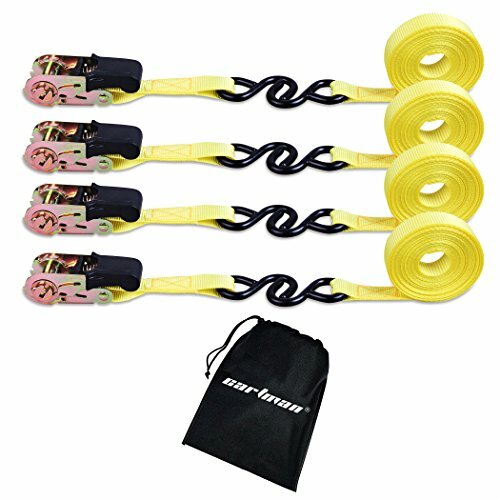 The workload limit of these straps is 200 lbs, and the break strength rating is 600 lbs. The metal parts are resistant to rust, and overall the ratchet is quite heavy, which should mean that it’s durable. 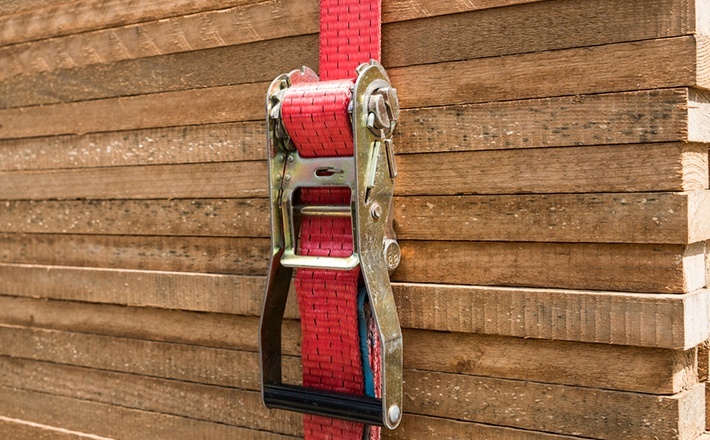 Made by a family-owned company these straps come with a lifetime warranty! The materials are of great quality, the ratchet is anodized and packs an ergonomic handle. On each side of the 12 included straps, there are coated S-hooks which are resistant to rust and very durable. The workload limit is 600 lbs, and the break strength is 1823 lbs. Which is more than enough for camping equipment. Now, if you need something really strong and heavy duty, then I think these might be the ones. They come with 4 pieces, and their break strength is amazing 3000 lbs. Which means the workload limit is around 1000 lbs. They are easy to use, the handle of the ratchet is super quick ,and the J-hooks are made of steel, so they can withstand a lot of weight. As I already mentioned, ratchet straps have a workload limit classifications. They usually start from 1.5 tons and even less, and they go all the way up to 10 tons and more. They should not be used for heavier cargo than the amount they are made to use for. You should also know to differentiate the working load limit and the break strength. You will probably see the specification of the break strength of the straps, and that number refers to the point at which the straps will fail. It’s determined by the weakest point, usually being the ratchet or end fittings. So, if the webbing is rated with 10,000 pounds and the ratchet is with 7,000 pounds, it means that the overall break strength is the 7,000 pounds not the average result of the two. If you never used a ratchet strap before, here’s a little guide to help you get the hang of it. It’s quite simple, and when you manage to do it once, you will do it again, but much faster this time. Open the handle and align the axle, so it’s pointing up. Close the ratchet, so the axle is easy to access. Take the webbing and drag it under the ratchet through the axle, and bring it out on the other side. Hook the straps and pull the loose end. Now tighten the strap by using the ratchet handle. Move the handle up and down until you reach the satisfying level of tightness. Once you’re done, close the handle to lock the ratchet. Do not to tighten it too much; this can cause damage to the straps. When you want to release the ratchet, pull the handle and hold it until you open the ratchet completely. Now the strap is loosened, and you can pull it out of the ratchet. A piece of cake, right? Much easier than trying to do all that with a piece of rope. If you’re having a hard time visualizing the process, check out this video to help yourself. Plan ahead for your camping trip, and get the right ratchet straps for your equipment. 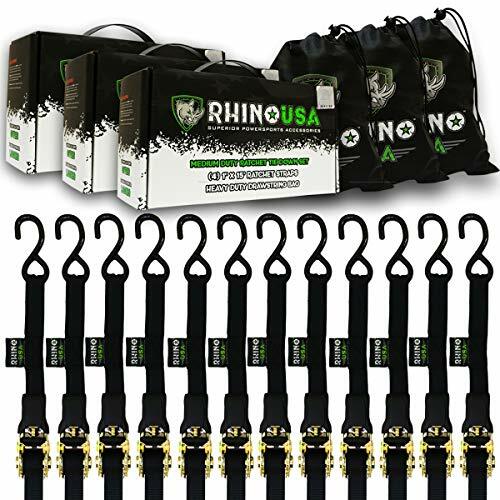 The best ratchet straps for me were the RHINO USA Ratchet Straps. They have the satisfying amount of WLL and the lifetime warranty is something I love to get everywhere I can. I hope you found the right straps for your needs, and that I was of help to you. You can leave your feedback in the comments, and you can ask me for some additional info as well.